Police Force headquarters in Abuja yesterday invited President of the Senate, Dr. Bukola Saraki, to answer questions relating to what the Police referred to as allegations indicting him from confessions of five gang leaders arrested for participation in the April 5 Offa bank robberies and killings of 33 innocent persons. The Police said the five gang leaders in the Offa bank robbery which left a bloody trail, that claimed the lives of nine (9) police officers, volunteered statements that they were political thugs of the Senate President, Dr. Bukola Saraki, and the governor of Kwara State, Alhaji Abdulfatah Ahmed. Reacting to the development, Dr Saraki in a statement by his Special Adviser, Media, Mr Yusuph Olaniyonu said that he “will want the entire public to disregard this claim as a baseless allegation and another ploy by the Police to implicate him by all means”, while Kwara State governor, Abdulfatah Ahmed, also dismissed the allegations, saying the state cannot not be held responsible for the behaviour of youths in the state who chose to deploy their empowerment wrongly. 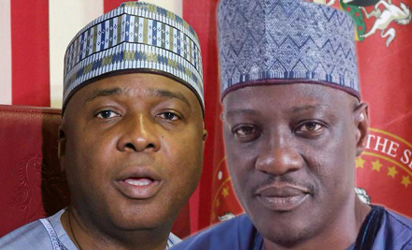 However, the All Progressives Congress, APC, and Peoples Democratic Party, PDP, in Kwara State, expressed divergent views on the issue, as the ruling party said the Police was out to nail the Senate president at all cost. But the PDP asked both the Senate president and Governor Ahmed to honour the Police invitation and clear their names. Confirming the invitation in a statement, the Force Public Relations Officer, ACP Jimoh Moshood, said: “The investigation into the Offa bank robbery and gruesome killings of more than 33 Innocent persons in Offa, Kwara State, on April 5, 2018, directed by the Inspector General of Police, IGP Ibrahim Idris, has made significant progress, successes and more revelations have been recorded. “The gang leaders and some of the principal suspects arrested for their active participation in the robbery and the killing of innocent persons have made confessional statements admitting to the various criminal roles they and their sponsors played in this dastardly and heinous crime. “The five gang leaders, including Ayoade Akinnibosun, Ibukunle Ogunleye, Adeola Abraham, Salawudeen Azeez, Niyi Ogundiran and some of the other seventeen suspects arrested for direct involvement and active participation in the Offa bank robbery and the gruesome killing of 33 innocent persons, which includes some pregnant women and nine police personnel, admitted, confessed and volunteered statements that they were political thugs of the Senate President, Senator Bukola Saraki, and the governor of Kwara State, Alhaji Abdulfatah Ahmed. “The two principal suspects confessed to be among the suspects led by the five gang leaders to carry out the Offa bank robbery, the attack on the Divisional Police Headquarters, Offa, and the killing of 33 innocent persons on April 5, 2018. “During interrogation, the five gang leaders confessed and volunteered statements that they carried out the bank robberies, the attack on the Divisional Police Headquarters in Offa and the killing of 33 innocent persons during the robbery of the following six banks, namely First Bank; Guarantee Trust Bank; ECO Bank, Zenith Bank; Union Bank; Ibolo Micro Finance Bank; and the Divisional Police Headquarters on April 5, 2018. “Millions of Naira from the banks and twenty one AK47 rifles belonging to the Nigeria Police Force in the Armoury of the Police Divisional Headquarters, Offa, were admitted to have been carted away by the five gang leaders and the other seventeen principal suspects during the robbery operations. “The five gang leaders confessed and volunteered statements to the Police investigators, giving a clear account of how they planned and carried out the bank robbery operation in Offa, the attack on the Police Division in Offa and how they killed the 33 innocent persons during the robbery. “The five gang leaders, who further confessed during investigation that they are political thugs under the name, Youth Liberation Movement, a.k.a “Good Boys”, admitted and confessed to have been sponsored with firearms, money and operational vehicles by the Senate President, Senator Bukola Saraki, and the governor of Kwara State, Alhaji Abdulfatah Ahmed. “In the course of discreet investigation into the confessions of these five gang leaders and the other seventeen principal suspects, a Lexus jeep GX-300 (Ash Colour) with a sticker plate number with inscription “SARAKI” “Kwara, State of Harmony”, used by the gang leader, Ayoade Akinnibosun, ‘M’ 37, during the bank robbery and the killing of the 33 innocent persons, was taken to Government House, Ilorin, on May 16, 2018, where the sticker plate number with inscription “SARAKI” “Kwara, State of Harmony” was removed before another plate number, Kwara, KMA 143 RM, registered in the name of Ayoade Akinnibosun, the overall commander of Offa bank robbery, was then attached to the vehicle to cover up the identity of the said vehicle. 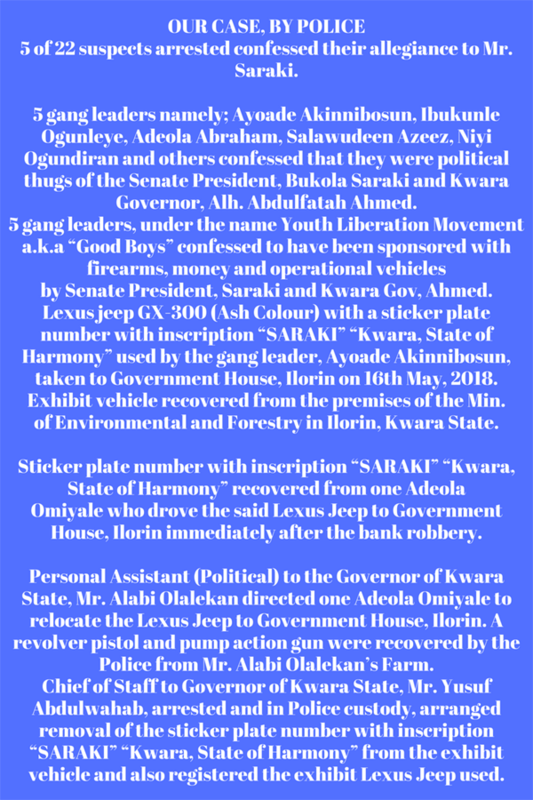 “The exhibit vehicle was subsequently recovered from the premises of the Ministry of Environmental and Forestry in Ilorin, Kwara State, while the sticker plate number with inscription, “SARAKI” “Kwara, State of Harmony”, removed from the vehicle, was recovered from one Adeola Omiyale who drove the said Lexus Jeep to Government House, Ilorin, immediately after the bank robbery. “The Personal Assistant (Political) to the governor of Kwara State, Mr. Alabi Olalekan, who is privy to information that the Police is looking for the Lexus Jeep as an exhibit used in the Offa bank robbery and the killing of 33 innocent persons directed one Adeola Omiyale to relocate the Lexus Jeep to Government House, Ilorin. “The PA (Political) is currently in Police custody and has made useful statement assisting the Police in further investigation into the case. “A revolver pistol and pump action gun were recovered by the Police Investigation Team from the Personal Assistant (Political) to the governor of Kwara State, Mr. Alabi Olalekan’s Farm where he directed his brother to hide them after his arrest by the Police. “In order to conceal evidence, the Chief of Staff to the governor of Kwara State, Mr. Yusuf Abdulwahab, who has been arrested and taken into Police custody, arranged the removal of the sticker plate number, with inscription “SARAKI” “Kwara, State of Harmony” from the exhibit vehicle and also registered the exhibit Lexus Jeep used in the Offa bank robbery and the killings of 33 innocent persons in the name of Ayoade Akinnibosun, the overall gang commander of Offa bank robbery, while Ayoade Akinnibosun was already in Police custody for more than six days before the registration of the vehicle. “Investigation is ongoing and effort is being intensified to arrest other suspects still at large. All suspects involved will be arraigned in court for prosecution on completion of investigation. “Meanwhile, the Senate President, Sen. Bukola Saraki is being invited by the Nigeria Police Force to report to the Force Intelligence Response Team office at Guzape, Abuja, to answer to the allegations leveled against him from the confessions of the five gang leaders, namely Ayoade Akinnibosun, Ibukunle Ogunleye, Adeola Abraham, Salawudeen Azeez, Niyi Ogundiran and some of the other seventeen suspects arrested for direct involvement and active participation in the Offa bank robbery operation. The suspects in Police custody in connection with the robbery operations are Ayoade Akinnibosun a.k.a AY, 37yrs, the gang leader who coordinated the killings from Oro, Irepodun LGA, Kwara State; Ibukunle Ogunleye, 36yrs, the gang leader who killed two persons from Oro, Irepodun LGA, Kwara State; Adeola Abraham, 35, gang leader who killed five persons, from Oro, Irepodun LGA, Kwara State; Salawudeen Azeez, 49, gang leader who killed two persons, hails from Oro, Irepodun LGA, Kwara State; and Niyi Ogundiran, 37, gang leader who killed two (2) persons, hails from Oro, Irepodun LGA, Kwara State. Others include Michael Adikwu, 30, sectional gang leader who killed 22 persons, mostly at the Police Station; Kabiru Afolabi, 26, principal suspect; Omoseni Kassim, 28, principal suspect; Kayode Opadokun, 35, principal suspect; Kazeem Abdulrasheed, 36, principal suspect; Azeez Abdullahi, 27, principal suspect; and Adewale Popoola, 22, principal suspect. Also in police custody are Adetoyese Muftau, 23, – Principal Suspect, Alexander Reuben 39Yrs – Principal Suspect, Richard Buba Terry 23, principal suspect; Peter Jasper Kuunfa, 23, principal suspect; Ikechukwu Ebuka Nnaji, 29, principal suspect; Moses Godwin, 28, principal suspect; and Adeola Omiyale, 38, hails from Isanlu Isin Town, Isin LGA, Kwara State. The Senate President, Dr. Bukola Saraki, last night asked Nigerians to disregard Police claim that he had anything to do with the robbers who attacked banks in Offa, Kwara State, on May 5, 2018, killing 33 persons. A statement signed by Special Adviser to the Senate president on Media and Publicity, Yusuph Olaniyonu, said: ‘’The attention of the Senate President, Dr. Abubakar Bukola Saraki, has been drawn to a story circulating online and apparently derived from a Press Conference addressed by the Police Public Relations Officer (PPRO), Moshood Jimoh, linking him (Saraki) to the Offa robbery. ‘’Dr. Saraki will want the entire public to disregard this claim as a baseless allegation and another ploy by the Police to implicate him by all means. “Let it be known that there is no way I could have been associated with armed robbery against my people. When the Offa robbery incident happened, I was the first top public official to pay a visit to the place and right there in the palace of the traditional ruler, I put a call through to this same Mr. Ibrahim Idris, the IGP, requesting him to make certain specific security arrangements as demanded by the people. “Members of the public will remember that on May 16, 2018, I alerted the Senate about the information passed on to me by my state governor, Dr. Abdulfatai Ahmed, over a plot by the Inspector General of Police, Mr. Ibrahim Idris, to frame me up by getting some suspected cultists arrested in Ilorin to implicate me. It is believed that the timely leakage of the plot in that case aborted the use of the suspected cultists to implicate me. Now, it is the Offa bank robbery suspects that are about to be used. “This plot is concocted to embarrass me and, in the mind of the IGP, it is his own response after his refusal to honour the invitation by the National Assembly, headed by me, for him to come and offer explanations on the rampant killings and violence across the country. “Like the earlier one, this frame-up will also fail as I hereby state categorically that I have no link with any band of criminals. As a person who has utmost respect for the rule of law and all constitutional institutions, when the invitation from the Police is formally extended to me, I will be ready to honour it without any delay. Meanwhile, Kwara State Governor, Alhaji Abdulfatah Ahmed, yesterday dismissed police allegations that he and Senate President, Bukola Saraki, were sponsoring, funding, arming or supporting political thuggery. In a statement issued by his Senior Special Assistant on Media and Communication, Dr. Muyideen Akorede, in response to a Nigeria Police statement accusing him of sponsoring political thugs allegedly linked to the Offa Armed robbery incident, Alhaji Ahmed described the allegations as false and rejected his alleged indictment by the Police or the armed robbery suspects in their custody. The governor affirmed that while the state government had empowered several youth groups under its acclaimed Small and Medium Enterprises, SME, scheme, neither he nor the statement government could be held liable for how beneficiaries utilized the credit. 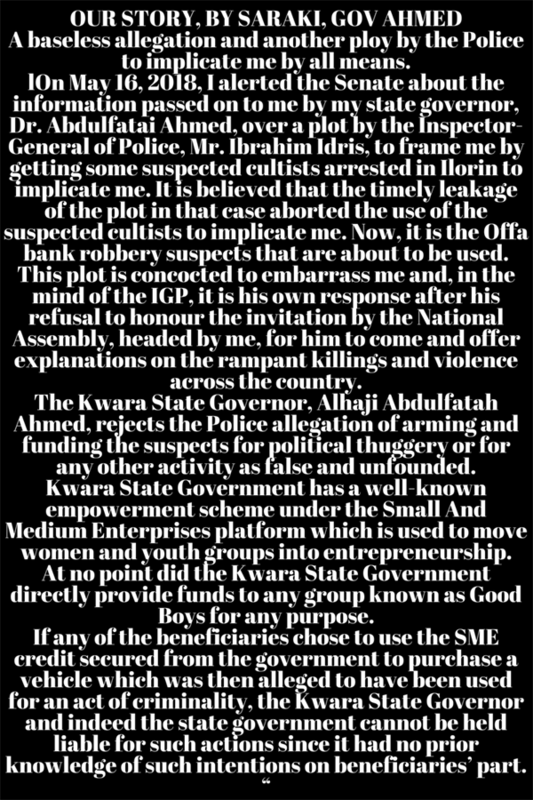 The statement read: “Kwara State governor, Alhaji Abdulfatah Ahmed, denies the allegations of supporting political thuggery or any other acts of criminality as alleged by the Nigeria Police or the suspects allegedly arrested in connection with the tragic Offa robbery. ‘’Neither has he at any time funded or provided arms to any individual or group in the state or anywhere in the country. “To set the records straight, Kwara State Government has a well-known empowerment scheme under the Small And Medium Enterprises platform which is used to move women and youths groups into entrepreneurship. “Consequently, several youth and women groups have benefited from the scheme to date. However, at no point did the Kwara State Government directly provide funds to any group known as Good Boys for any purpose. “The Kwara State Governor, Alhaji Abdulfatah Ahmed, also rejects the Police allegation of arming and funding the suspects for political thuggery or for any other activity as false and unfounded as thuggery or any other form of criminality is neither encouraged nor supported by the state government or its agents. Also reacting to the development yesterday, ruling All Progressives Congress, APC, in Kwara State and Peoples Democratic Party, PDP, in the state have expressed divergent views over the invitation of Saraki and Governor Ahmed by the Police. Spokesman of the All Progressives Congress, APC, Alhaji Suleiman Buhari, said he was short of words, describing the development as the desperate extent the police could go to get at the Senate President, chairman of Peoples Democratic Party, PDP, in the state, Akogun Iyiola Oyedepo, urged the two personalities to appear before the police and clear their names. The APC spokesman said: ‘’I am short of words, and this is coming as a big shock to me. I’m sure Nigerians would know that the Nigerian Police is desperate to blackmail the Senate President, and this is just one of the means but I am sure they will fail. ‘’The issue is that the two of them might be wrongfully or genuinely mentioned, so when they get there, they would be able to clear their names. ‘’For the Senate President, Dr Bukola Saraki, he has no immunity, so he should just go and clear his name. Comments here does not express the view of Bestxplorer management. THREE TIMES PRESIDENTIAL CANDIDATE OF NPP, Nana Akuffo-Addo EMERGED GHANA NEW ELECETED PRESIDENT.